Solutions in the VidiGo range include VidiGo Studio Automation, the ultimate control to create and supervise rundowns for a fully automated newscast, VidiGo Visual Radio, the best solution in the market to create an entertaining and compelling visual radio show without the need for extra staff and VidiGo Graphics, the tool that allows users to create broadcast graphics in Adobe Photoshop and animate them in Flash. 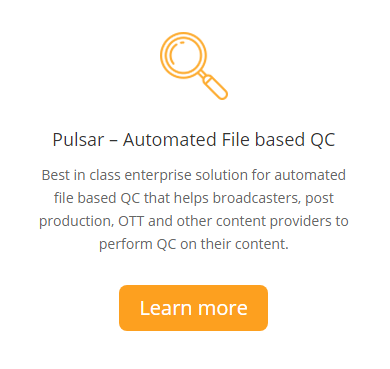 Venera’s flagship product “Pulsar – Automated Content Verifier” is used worldwide by leading organisations such as Disney, ESPN, Encompass Media, and Telecom Italia for automating content QC processes from Ingest through Delivery. Pulsar was one of the first solutions to introduce capabilities such as loudness measurement on files, track layouts and QC for adaptive bitrate content. In 2016, Venera introduced the industry’s first true native cloud QC solution, Quasar. Quasar can seamlessly work with OTT workflows for all major cloud platforms such as AWS, Azure and Oracle plus it can also work in the user's private cloud setup. With its usage based monthly plans, Quasar has become the go to QC solution for OTT services.